Your Very Own Personal Wedding Planner Can Bring You Peace Of Mind! 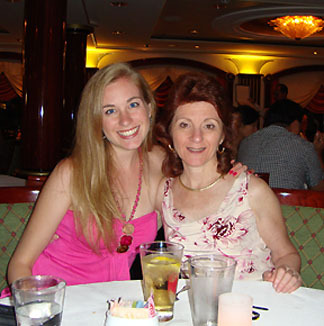 Hello, We're Chantal and Chantal Jane a mother daughter team that loves planning weddings. Thank you for dropping in on us! You've probably read a few of our "Wedding Ideas" and are wondering who we are and how we came to be Wedding Planners. Before I get into our story I'd like you to be able to know who you are talking with so I've included a picture of myself and my daughter, Chantal Jane. The above was one fabulous wedding! I'll start with myself first. Since I don't like long stories, I'll bet you don't either, I'll keep this short but informative. I'm an Accountant by education but prefer to be "out and about" and meeting new people. I began my professional career on Wall Street and loved the excitement of the ups and downs of the Stock Market but did not enjoy the constant stress that I was under. I changed gears and worked as an Office Manager in a Bank until my daughter was born. After my daughter's birth, I decided to take some time off and worked as a Volunteer in my local town, was part of the PTA at my daughter's school and did some Fund Raising for a camp for underprivileged, inner city children. When my daughter went to High School, she asked me to be a Substitute Teacher in her School. Working with High School students was a lot of fun and very rewarding but I was looking for something to do that would help others on a more intimate level while earning an income. As mentioned before, I'm a people person and enjoy putting smiles on people's faces. So when a friend of mine mentioned that I had a lot of experience as a Party Planner and that I should capitalize on my past experiences and become a Wedding Planner, it all came together and felt "right." My next venture ~ learning about being a Wedding Consultant was easy, because I understand budgets, know how to listen to people's needs and have a keen sense of what works well and is in good taste. My degree in Accounting taught me how to get to the bottom line as quickly as possible without overwhelming clients. One of my speech professors in college taught us that if you can't get your point across in less than 4 minutes, stop talking because no one is listening. I brought this skill to my Wedding Planning business, so you will notice that my web pages give lots of information without being wordy. For me, the difficult part of being your very own personal wedding planner was learning how to build a Web Site. That's where my daughter, Chantal Jane came in. She's been an invaluable resource for building my Web Site and her exquisite taste has added another dimension to helping brides make good choices. I still struggle with the technical aspect of the Web Site – but I'm gaining on it. If you see something that needs to be added or changed, please contact me and I will be happy to do so. If you have any questions, please contact me and I will help resolve your issues and do everything I can to help you have the Wedding of your Dreams. As one can imagine, there are many different types of personalities and brides are no exception. We enjoy the process of working with all brides and watching their ideas become a beautiful reality. Sometimes couples have very limited budgets and we use all of our skills and shopping resources to help them have the wedding of their dreams while keeping within their budget. 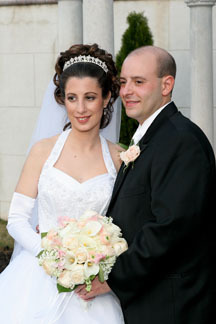 If you read through our site you will notice many secrets about how to purchase wedding items at greatly reduced costs. This is one of the very first weddings that I planned. We worked with this bride and she and her entire family were exceptional! They were loving and so supportive of each other that working with them was a breeze. This picture captures the essence of their devotion to each other. We just knew you would be curious to see the bride and groom on their special day so, we included a picture of the happy couple above. Being Your Very Own Personal Wedding Planner is important to us, so if you would like to leave us a story about your engagement or wedding, please write to us and we will post your story or pictures on our web site for your enjoyment.